TOMBALL (September 24,2018) – A 16-year-old boy is in critical condition after being hit by a pickup truck. The accident occurred on East Main at Hufsmith-Kohrville Road (FM 2920 at FM 2978). The boy worked at McDonald’s and was heading home riding his bike when he collided with a pickup truck. According to Tomball Police Department, the victim didn’t have lights on his bicycle and was in a moving lane of traffic during the crash. The driver of the pickup truck stated that he didn’t see him or any lights. The boy was transported by Lifeflight to Memorial Hermann Hospital in critical condition. The driver stopped and waited for police and is not expected to be charged for the incident. Wear a helmet. In the event of a crash or a fall, a helmet will protect a cyclist from head trauma and brain damage. Obey traffic laws. Bicyclists must obey the same traffic laws as a motorist. Ride with the flow of traffic. Cyclists ride on the right side in the same direction as other vehicles and must yield to traffic. Make sure the bike is equipped. A bike should have reflectors on the rear, front, pedals, and spokes. Wear bright clothing. Bicyclists should remain visible to others by wearing bright colors. In Houston, bicycling is common among residents and tourists. 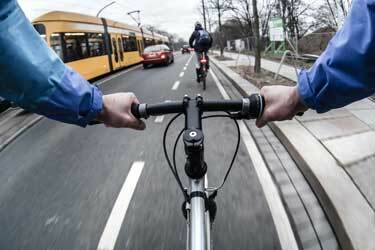 When riders follow bicycle safety tips it helps reduce accidents. Similar to a car accident, a bike accident can be just as unpredictable. If a motorist has left you injured in a bike accident, it is important to contact a legal expert to help you evaluate your options. Call (713) 987-7111 or send us an email to discuss your accident case.